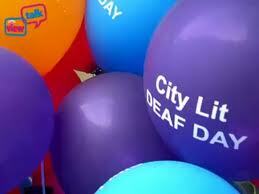 Signature will be at Deaf Day at City Lit in London on Saturday 26 April for a fun day of deaf related events, workshops, information and socialising. Signature has more than 30 years experience in promoting access for deaf and deafblind people and our popular qualifications are suitable for those who wish to learn just for fun right through to professional level. They are accredited by Ofqual, can lead to NRCPD registration and many are eligible for funding. Our campaign work for a GCSE BSL also continues. Come and meet us to find out about our qualifications. Learning how to communicate with deaf people can open up opportunities for integration into a whole new language and culture. British Sign Language (BSL) is a fun, visual language to learn. Signature student, Louise Gavin, said, “One of the best things I’ve ever done in my life! Learning British Sign Language has opened my eyes and changed me as a person in a really positive way”. You can study our qualifications at around 500 locations across the UK, so finding a course near you is easy. When you start to learn, you will have a wealth of support materials, including an online BSL Homework package, at your fingertips. Come and meet us at our stand at Deaf Day for your chance to win. Remember to visit us at Deaf Day to find out what’s new at Signature and to learn more about what we can offer you.